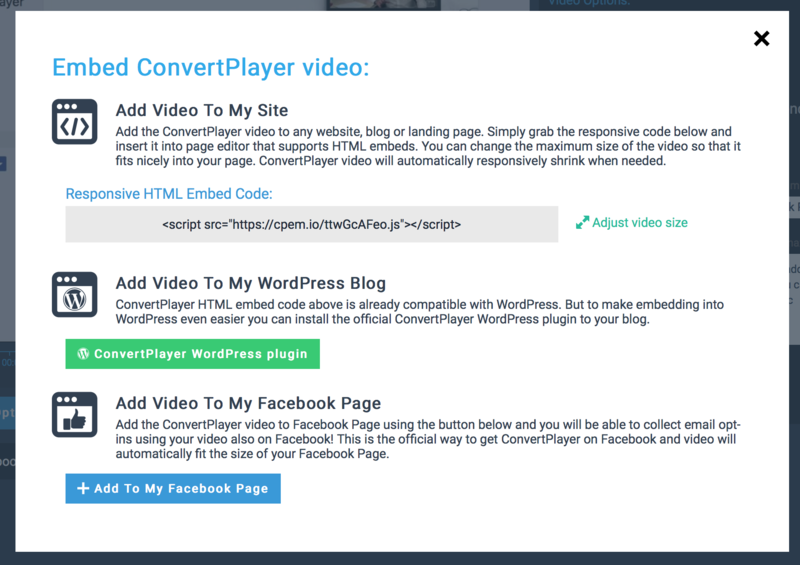 Customise the video as usual, add your CTA, Opt-in and share buttons in the ConvertPlayer video editor. Click on Embed this video inside ConvertPlayer and then new dialog with Embed options will open. Select from the dropdown dialog from all of your Facebook Pages the one you want the video to be added to. Confirm and you are set! If you want to add different video to your Facebook page and replace the current one. 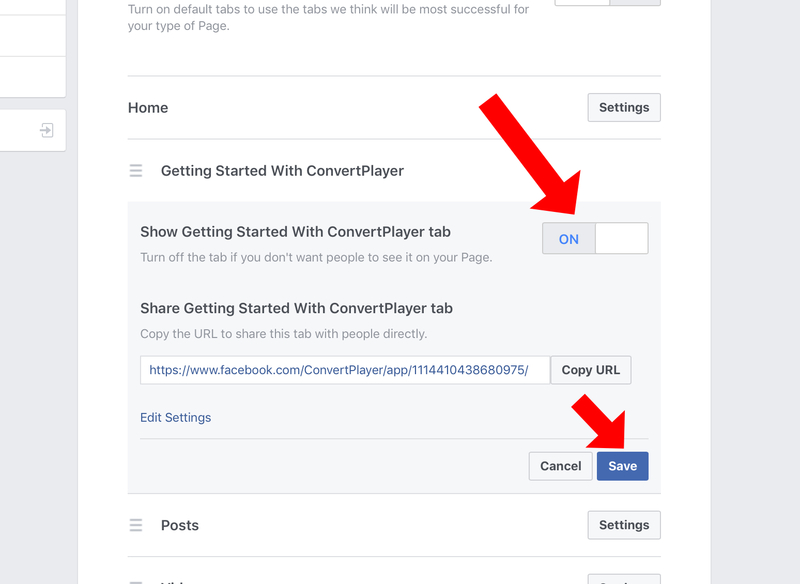 You have to first remove the current Page Tab with ConvertPlayer video in Facebook Page settings. Facebook will only let you add one "Page Tab" from one application and therefore you can only add one ConvertPlayer video to one Facebook Page. Facebook won't let you display this page on mobile phones. It's a limitation of their platform. If you are getting error from Facebook: "All of the Facebook Pages that you are an admin of have already had this App Tab installed" it means that you don't have any Facebook Pages without ConvertPlayer video and to continue you'd have to remove one video form a page first. See below to learn how to remove the Tab from your Page. How to remove the Video Tab from your Facebook Page? Go to your Facebook Page Settings on Facebook. And then click on Edit Page. Find the ConvertPlayer tab in the list. It is called Video ( not "Videos") by default. But if you watched the video above you might have changed it's name. 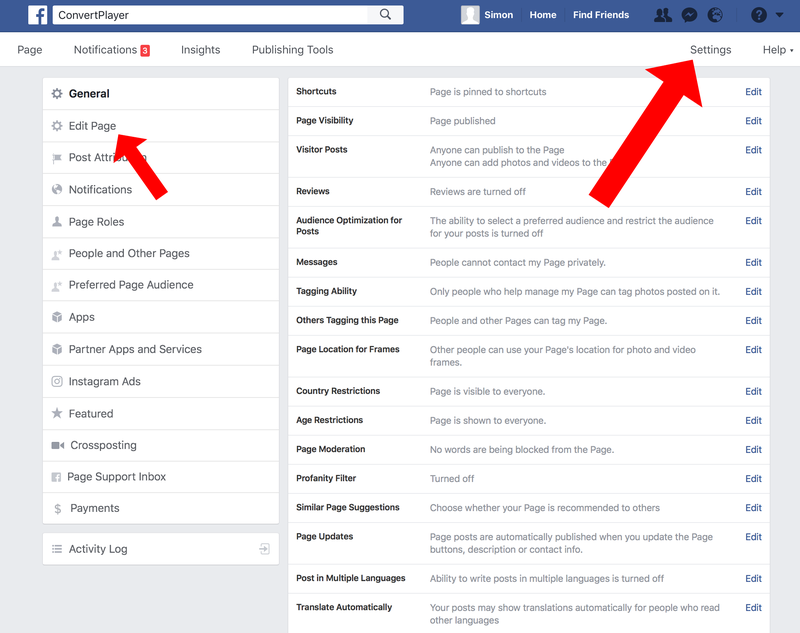 Expand the section with your Page Tab by clicking on Settings. And flip the button from On to Off. And then click save. This will remove the Tab from your Facebook Page.